The Bulle MOLLE nalgene and water bottle pouch is large utility pouch which takes water bottles up to the size of the British issue Osprey water bottle and mug. 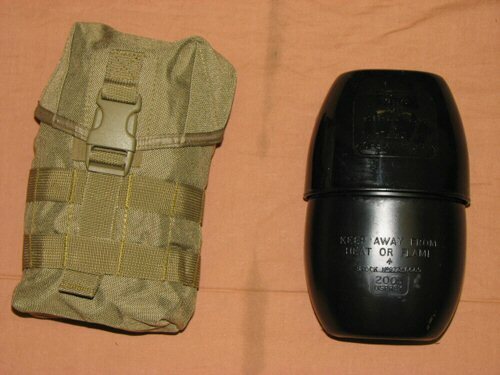 It is also an excellent size for carrying phosphorus grenades large lifeboat smoke grenades. The pouch neatly carries its contents inside its large, shaped main compartment, and the flap is a profiled, shaped design which closes onto the body, thus limiting the amount of dust and dirt that can get inside. 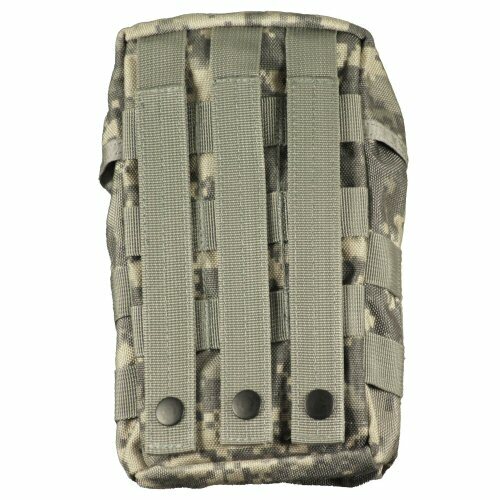 The exterior of the pouch is has two MOLLE straps sewn down around the main body which enables small utility pockets to be attached for accessories such as water purification tablets, extra pistol magazine pouches, multi-tool pouches and similar items. The pouch is double secured with an adjustable UTX-Flex Stealth quick release buckle, and silenceable velcro flap. 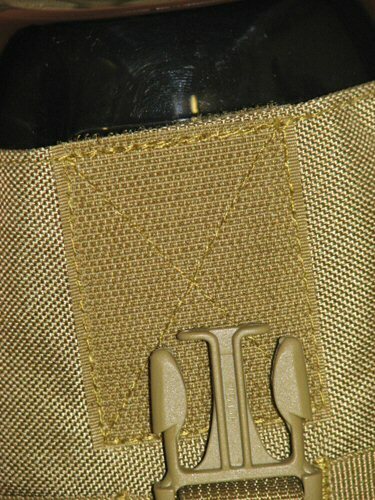 The velcro on the flap is a loop (soft) section which meets up with a hooked (rough) section on the body of the pouch. This rough velcro can be silenced and de-activated by rolling a flap of smooth velcro over the top. This is provided on the pouch and requires no modification. UTX-Flex Stealth buckles are designed for military use and have to pass stringent strength, heat and burn resistance tests, making them one of the best on the market for this kind of application. The pouch has one rivetted eyelet on the bottom to allow for drainage. The pouch measures 12cm wide at the base, 21cm high and 5cm deep. The pouch is designed to get wider towards the middle, so the depth increases to 7cm at the opening of the pouch on left and right, assuming that the width remains 12cm. The pouch is made of 1000D texturised Cordura. Price is for ONE pouch. Any accessories shown are for illustration purposes only and are not included with the pouch. 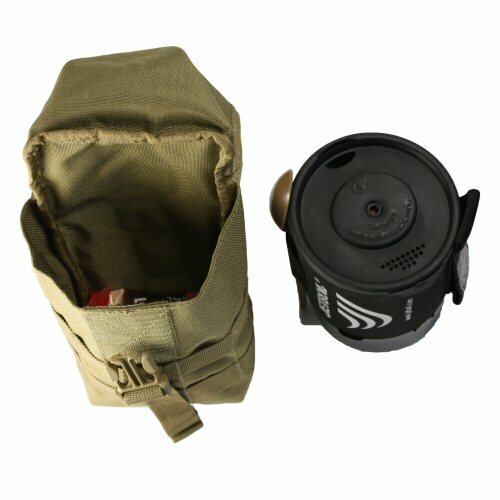 A top down view of the tan version of the pouch, showing how a Jetboil Zip is able to fit inside, together with a few satchets of coffee, hot chocolate or cup soup. 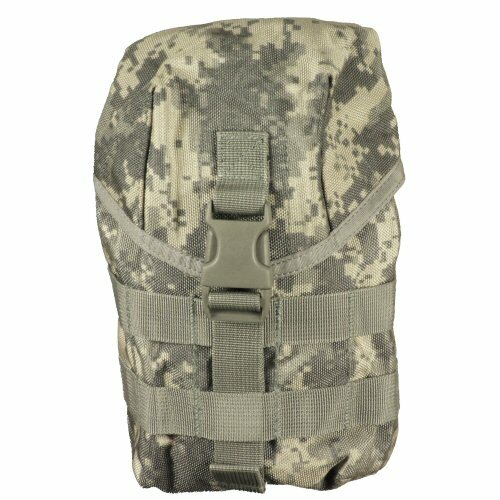 View of the pouch side by side with an Osprey water bottle and cup. 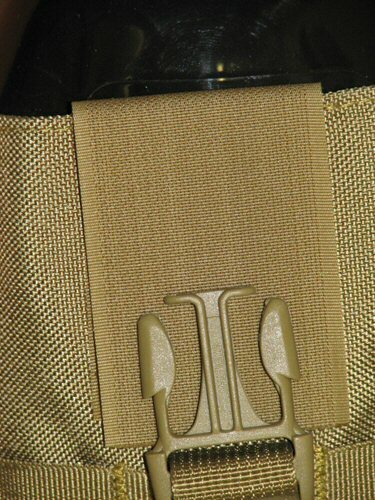 Detailed view of the velcro and quick release buckle. View of the velcro silenced with integrated velcro flap.